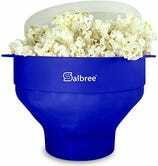 Movie theater popcorn is, objectively, the best popcorn. Fortunately, with the right supplies, you can make popcorn that’s almost as good at home. Here are all the supplies you need. Obviously, you won’t get very far without some popcorn kernels. 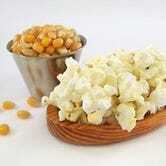 You don’t need any particular kind of kernels, as the flavor comes later. However, how much popcorn you want might determine what kind you get. Small bottles from companies like Pop Secret will do fine for a few bowls, but if you’re planning to make a lot of popcorn over a long period of time, you might want to get bags of the stuff at a bulk rate. Air-popped popcorn is the healthier option, but we’re not going for healthy. We’re going for that sweet, delicious movie theater taste. 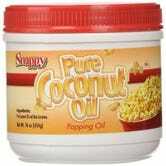 Most major theater chains heat kernels in butter-flavored coconut oil. You don’t need a lot to cook popcorn, so a small jar like this one from Snappy can do the trick, but you can also buy the oil by the gallon. 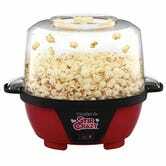 If you want lower calorie, fat- and cholesterol-free popcorn, you should, uh, skip this step. If you have a microwave, you don’t necessarily need an extra appliance to pop some kernels. You can put oil and kernels into this microwavable bowl and microwave it for a few minutes. The downside is that it’s a little small and, without a separate appliance, it’s just a bowl. 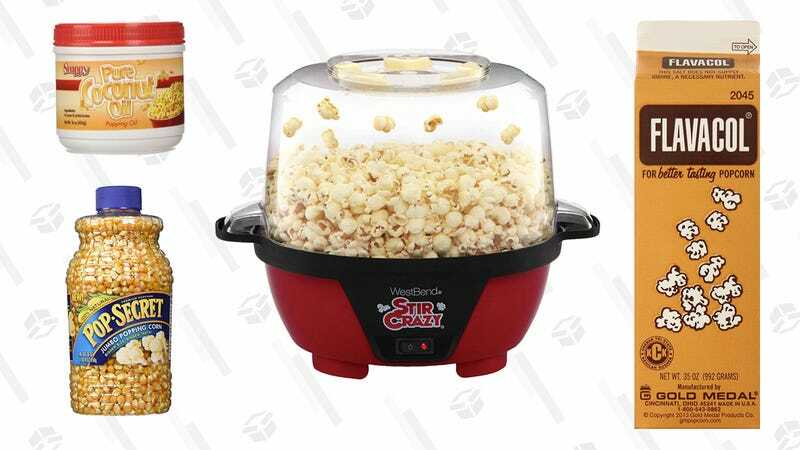 For a standalone solution, this West Bend popper can cook your popcorn all on its own. 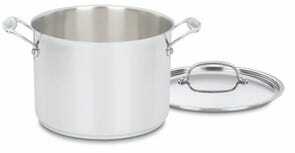 When you’re done, the domed lid can be turned upside down and used as a serving bowl. A good, old fashioned stockpot on the stove can do the trick as well, but you’ll need to transfer the popcorn to a separate bowl for obvious reasons, which creates more dirty dishes. Finally, it’s time to add the best part: that delicious orange butter salt. For $8, you get the same 35oz carton of Flavacol’s uniquely flavored salt that you’d find at the theater. 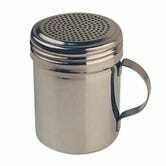 For the authentic experience, you might also want one of those big metal shakers, but any salt shaker will do. Most popcorn poppers recommend adding some melted butter after you cook your popcorn, but I’ve found that if you use the right oil and this butter salt, you’re good to go.